When Kimberly Repp saw how high Washington County's suicide numbers were each year, she vowed that she would do something about it. Repp is the supervisor of the county's public health program and the county's epidemiologist, which makes her responsible for tracking and responding to diseases that affect public health, such as annual flu outbreaks. A longer version of this article was published by Street Roots on April 7 and can be read at streetroots.org. This story is part of "Breaking the Silence," a media collaboration focused on suicides in Oregon. Learn more at breakingthesilenceOR.com. "That's not just kind of bad," Repp said. "That's just ... astronomically bad." Starting in 2014, Repp began accompanying the county's death investigators to death scenes to see what clues or evidence would be present in the room where a person was last living. She visited more than 200 scenes in a two-year period. From that, she developed a list of 46 risk factors that contributed to a person's death by suicide. 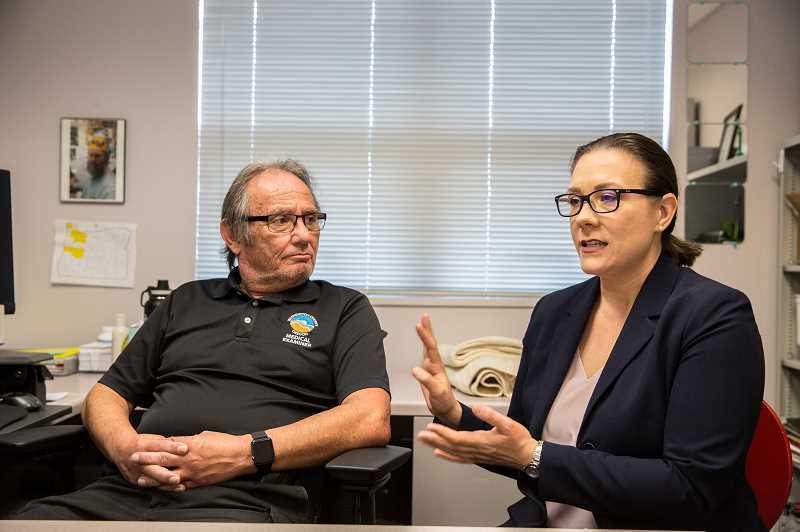 Since 2015, those risk factors have helped county officials expand the types of people and places that Washington County and partner organizations target for suicide trainings, prevention and intervention efforts. As a result, the county's suicide rate has fallen by 40 percent in three years. "That data has given us the information we need to make tangible interventions in our community," Repp said. Among the list of risk factors are what one might expect: depression, social isolation and problems with drug addiction or family or money. But one leaped out to Repp, and others; a quiet social problem that drastically affects increasing numbers of poor people in recent years: eviction. "I was really, really surprised by how prevalent eviction, as a crisis, and ongoing housing issues were ... directly impacting our suicide rates in Washington County," Repp said. In response, Repp worked with the Washington County Sheriff's Office, which delivers court-ordered evictions, to have the phone number for a crisis line printed at the top of all eviction paperwork that a renter is given. Members of the Washington County Mental Health Response Team, which intervenes when people are experiencing mental health crises, also will go with a sheriff's deputy who is serving an eviction if they know that the person is likely to be extremely upset. Approximately 1 percent of suicides — roughly five to 10 people per year — are associated with eviction or the loss of a home. Evictions are stressful, especially to low-income people who do not necessarily have money saved to pay for moving costs, a security deposit and first and last month's rent. If someone is forcibly removed from their home as the result of an eviction, which happens to about 1 percent of the Oregon population each year, it caps off, at times, months of worry and stress about the loss of one's home. Zwetchkenbaum estimated that approximately one out of 10 people call the crisis line due to eviction or the threat of eviction, homelessness or housing instability. "The fear of losing your housing is definitely something that I've heard a lot," she said. "The fear of becoming houseless can really get people to the point where they're just like, 'I'm not going to do that. I would rather die than become houseless.'" In 2018, more than 2 percent of calls — 1,335 out of 41,145 — came from people who explicitly stated that homelessness was the primary stressor in their lives. Those numbers do not include people experiencing housing instability; people who fear they will lose their home or are about to. It also does not include people who say they are couch surfing. Lines for Life does not collect and isolate that data. When Repp began visiting the locations of Washington County suicides, she said that she could "feel the suffering" in the rooms where people ended their lives. People often left eviction papers on their dining room or coffee tables - out in the open, where anyone could see them, as if the person had just set them there. As a result of Repp's efforts, Washington County now can isolate the main risk factors that can contribute to someone's death by suicide. "It's an oversimplification to suggest that one risk would cause one to end their life," she said. "It's a lifetime culmination of experiences that lead there." Repp's data shows that depression, physical health problems, social isolation and a crisis that took place within the last two weeks — which includes eviction — are the most prevalent risk factors for suicide in Washington County. That data allows Repp and others to isolate places that people who are thinking of suicide frequent. For example, the data shows that many people, within two weeks of dying by suicide, will take their pets to an animal shelter. Staff at the county Humane Society locations have received suicide prevention training, as have the staff at a Budget Hotel where a number of people died by suicide. Repp's data also shows that people will see their doctor within two weeks of dying; an example, Repp suspects, of how people stick to their normal routine. She is now working with hospitals and doctors' offices to screen for suicide. A cornerstone of those trainings is what is known as "QPR," which stands for "question, persuade and refer." People are trained to ask someone, point blank, if they have thoughts of harming themselves, and then to persuade someone who is having those thoughts to think of people in their lives who can help and of parts of their life to be grateful for or to look forward to. Trainees are then given resources they can refer people to for further help. Since the county's suicide intervention efforts began in 2015, about five deaths with eviction as a risk factor have been prevented each year. "It could be life-threatening bad news," Repp said of eviction. "If putting a piece of paper (in eviction paperwork) saves even one life, we're going to do it. It could mean the difference between life and death to someone." "It's happened multiple times," she said. "It's hard to get a positive response to public health work during your lifetime. It's profound."